TwoMorrows Publishing is re-releasing the definitive biography of the man who changed comics storytelling forever. June 2015 marks the 75th anniversary of The Spirit’s first appearance in Sunday newspapers around the world. This follows the 75th Anniversary of Superman in 2013 and Batman in 2014. So much more than just a new printing, this remastered and expanded, full-color hardcover Deluxe Edition of Bob Andelman's long out-of-print biography explores the fascinating life of Will Eisner, detailing a more than 70-year career that in which he spearheaded comics for adult readers and created the first widely accepted graphic novel, A Contract with God. From his childhood to famously turning down a proposal for Superman, to educating Army soldiers in P.S. 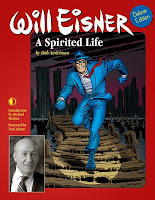 Magazine and creating The Spirit, Eisner's personal and professional life is told in dramatic detail. Andelman spent almost three years interviewing Eisner prior to his passing, researching his life and work and interviewing friends, family, and colleagues. 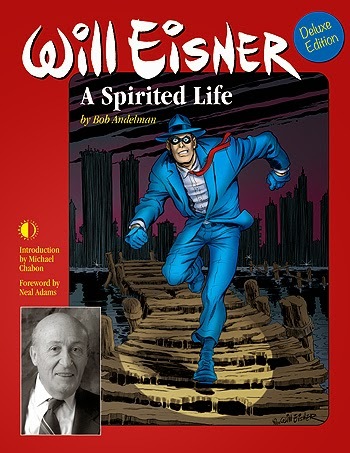 In addition to dozens of full-color images from Will's archives and private collections (not found in the original edition), this expanded Deluxe Edition includes a series of new interviews which clear the air on some topics left unfinished by the first edition, and add depth to the reader's knowledge of Eisner’s body of work. This full-color hardcover is 256 pages long, and retails for $39.95. It is available now in both print and digital editions, through TwoMorrows website (www.twomorrows.com), comic and bookstores through Diamond Comic/Book Distributors, on Amazon.com, and through the company's app on the Apple and Android platforms. Bob Andelman is a St. Petersburg, Florida-based writer. He is the author or co-author of 15 books, including three bestsellers: BUILT FROM SCRATCH: How a Couple of Regular Guys Grew The Home Depot from Nothing to $30 Billion with Bernie Marcus and Arthur Blank; THE PROFIT ZONE: How Strategic Business Design Will Lead You to Tomorrow’s Profits with Adrian Slywotzky; and MEAN BUSINESS: How I Save Bad Companies and Make Good Companies Great with Albert J. Dunlap. He is also the author of STADIUM FOR RENT: Tampa Bay’s Quest for Major League Baseball and co-author of THE WAWA WAY; BUILDING ATLANTA; THE PROFILER; and KEEP YOUR EYE ON THE MARSHMALLOW. He is also the host of the Mr. Media® Interviews video podcast (http://www.MrMedia.com) now in its ninth year. Saturday, June 13, Time 11 a.m.-3 p.m.
Saturday, July 11, 2-4 p.m.
Mon, July 18 at 3 p.m.
Saturday, July 25 at 3 p.m.